Please see the attached image. A friends Grandfather passed away and they are cleaning up his estate. They asked if I could ID some stuff. This one has me stumped. All I know is that it's probably from the WW2 era. Any ideas? Please see the attached image. A friends Grandfather passed away and they are cleaning up his estate. They asked if I could ID some stuff for this. This one has me stumped. All I know is that it's probably from the WW2 era. Any ideas? 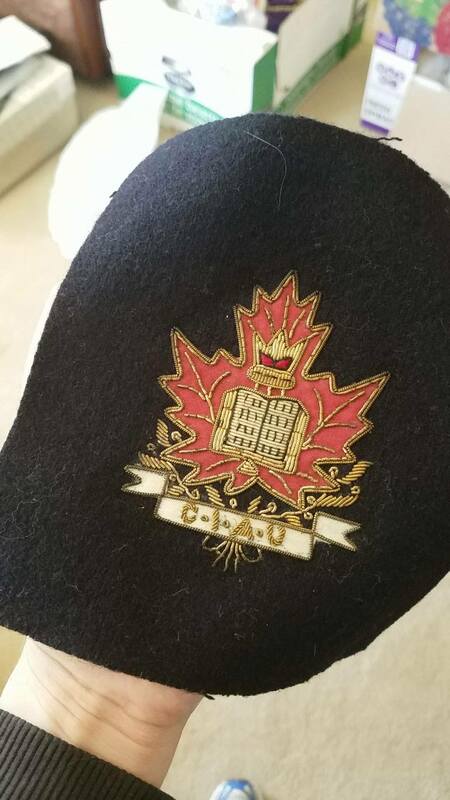 Not a hundred percent sure but this thing looks like an old badge for the Canadian Interuniversity Athletic Union which then became Canadian Interuniversity Sports (CIS) and then rebranded as U Sports. Thanks. I've been looking all over for an image without any luck. I remember from my days attending the Brandon Bobcats Basketball games (back when they were still CIAU and pretty good under Jerry Hemmings) that the championship pennants or some such thing had crests somewhat like these. Based on the shape of the maple leaf I would expect this is a pretty old crest. The original Canadian Interuniversity Athletic Union (CIAU) Central was founded in 1906 and existed until 1955, composed only of universities from Ontario and Quebec. With the collapse of the CIAU Central in the mid-1950s, calls for a new, national governing body for university sport accelerated. Once the Royal Military College of Canada became a degree granting institution, Major W.J. (Danny) McLeod, athletic director at the RMC directed the establishment of the Canadian Intercollegiate Athletic Union (CIAU) in 1961.